I was going through the ‘unmarked’ VHS tapes in my big bin the other day when I came across this little gem: a homemade video filmed in 1988 at Grandpa Groovy’s Richmond Convention. I really have no information on it; my friend and mentor Jack Yount pops up several times during the tape so it’s possible it was one of his vacation videos; that or it was sent to him because he’s in it. I’m not sure. WIth no label it’s really hard to tell the story, but I’d rather the story be told, so here you are. 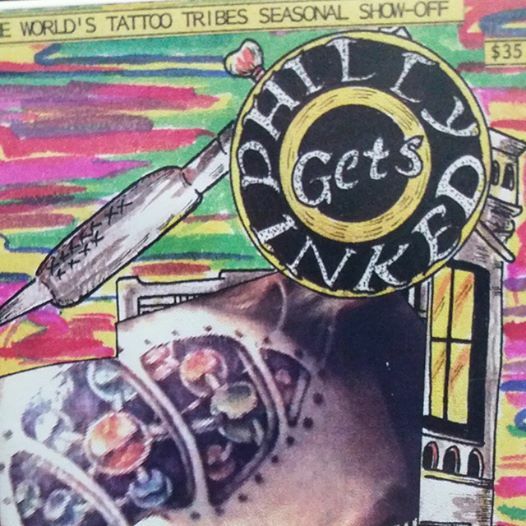 Since it wasn’t a commercially produced tape it suffers from loud background noise (which I tried to lessen; to mixed success) and shaky camera work- but it also features the legendary Paul Rogers tattooing, so I figured the compromise was worth it. Other familiar faces include Randy Adams, Gil Montie, Sailor Moses and Lyle Tuttle. I probably could have tightened up the edit a little and removed some of the camera panning, but I thought it added a little bit of character to see the folks who came out for Grandpa Groovy’s show versus just focusing on the tattooers. I’ll be scanning through the rest of the tape soon to see what else is there to be had; until then- enjoy! Another ‘Colored People Invade San Diego’ installment. Krystyne the Kolorful. Krystyne was an exotic dancer from Alberta, Canada who had approximately 95% coverage and was a famous ‘tattooed lady’ of the 1980s. No audio with her. Ed Hardy. Ed gives a brief rundown of his history with tattooing; stuff that’s already been covered in other videos, but it’s always nice to hear Ed talk like a beatnik. Henk ‘Hanky Panky’ Schiffmacher talking about the (late 1980s) state of European tattooing. I still hold Henk’s Amsterdam Tattoo Convention (I went in 1995- have the video just don’t have an 8mm player to convert it!) as one of the most impressive conventions I’ve ever been to and his contribution to the tattoo world (with documenting and with his Amsterdam Tattoo Museum) has been legendary but not nearly as celebrated as it should be. This tape is showing wear and the audio is slightly unsynched. I had a complete backup of it but the entire thing was off; so I’ve been slowly recapturing scenes (versus the entire movie) and redoing the audio. It’s taking a while, but at least the clips are preserved on the internet.